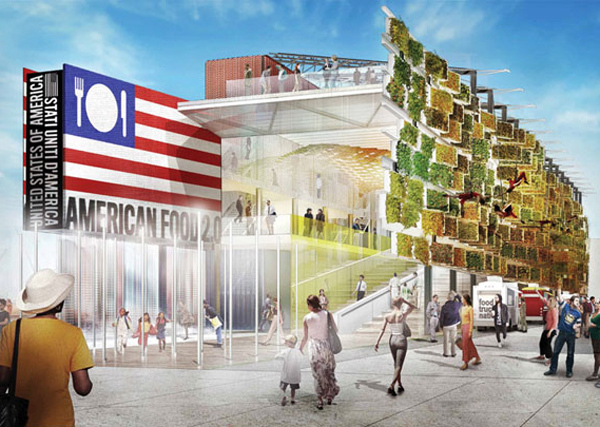 Biber Architects just broke ground on the USA Pavilion, which will bring an incredible vertical farm to the 2015 Milan Expo! The international event, which attracts up to 20 million visitors each year, is always heavily centered around sustainable design, but each year, there is a specific theme for the pavilions. 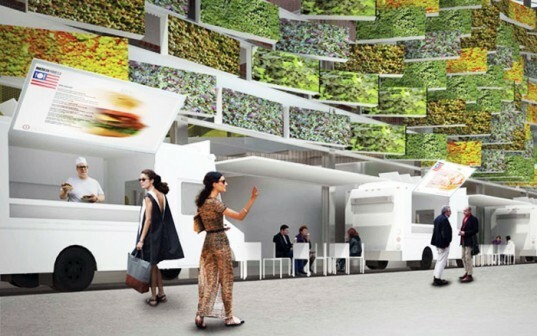 For 2015, the theme of the six month event is “Feeding the Planet, Energy for Life” and from the looks of their design, Biber Architects have hit the nail on the head with their ultra high-tech green garden wall entitled "American Food 2.0." To showcase the event’s 2015 theme, the architects have developed a massive and literal green machine, inside and out. The large vertical garden will be planted with edible plants and vegetables and will use a hydroponic growing system to feed the various crops. The architects are working with landscape architects to decide on what type of edible fruits and veggies will work on the wall, but it looks like they’re creating a home for even the most fickle crops. A rain water irrigation system will also be installed and the wall’s mounting system will be equipped with rotating panels that can be moved to absorb the optimal amount of sunlight throughout the day. Outside the structure, the pavilion will feature “food truck” kiosks that will serve local foods from the different U.S. regions to showcase the country’s culinary diversity. Additionally, the U.S. pavilion will have numerous talks and round-table discussions on the many issues surrounding sustainability, agriculture and technology. In addition to the pavilion’s star garden feature, the structure will be modeled as an open farm layout on the interior. Built with recyclable steel framing and a composite wood floor slab that will be chipped for reuse, the structure is highly adaptable. The central walkway will even be made of reused wood from actual boardwalks in New York. The roof will be installed with ultra-thin solar panels and photochromatic glass. A misting system will cool the building without the use of air-conditioning. The U.S. Department of State selected the Friends of the USA Pavilion Milano 2015 (which is made up of the James Beard Foundation and the International Culinary Center) to spearhead the project’s organization – from fundraising to finding partners and sponsors, which include companies like General Electric, 3M, and DuPont, amongst others. To showcase the event's 2015 theme, the architects have developed a massive and literal green machine, inside and out. The large vertical garden will be planted with edible plants and vegetables and will use a hydroponic growing system to feed the various crops. The architects are working with landscape architects to decide on what type of edible fruits and veggies will work on the wall, but it looks like they're creating a home for even the most fickle crops. A rainwater irrigation system will also be installed and the wall's mounting system will be equipped with rotating panels that can be moved to absorb the optimal amount of sunlight throughout the day. Outside the structure, the pavilion will feature “food truck” kiosks that will serve local foods from the different U.S. regions to showcase the country's culinary diversity. Additionally, the U.S. pavilion will have numerous talks and round-table discussions on the many issues surrounding sustainability, agriculture and technology. In addition to the pavilion's star garden feature, the structure will be modeled as an open farm layout on the interior. Built with recyclable steel framing and a composite wood floor slab that will be chipped for reuse, the structure is highly adaptable. 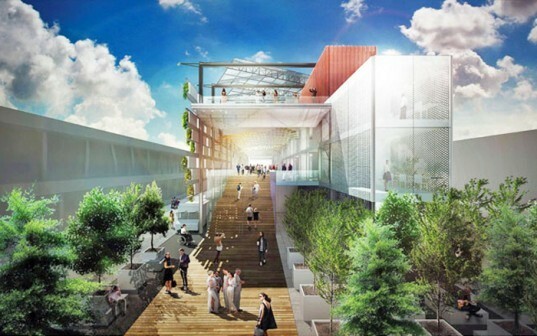 The central walkway will even be made of reused wood from actual boardwalks in New York.